National carrier Air India Tuesday said the government has provided sovereign backing to its non-convertible debentures (NCD) worth Rs.7,400 crore. According to the airline, the finance ministry has approved the sovereign backing for the NCD, whose proceeds will be used to repay short-term working capital loans from a consortium of 19 banks. "The NCD will have a tenure of 19 years and priced at a spread over the applicable government security. The government has capped the spread at 70 basis points," the airline said in a statement. The airline will be able to save on the interest cost of about Rs.900 crore per annum by repaying the short-term loans. "The banks will now have a reduced exposure to Air India after the said short-term loan is paid out by the airline," the statement said. The airline further said it would issue the NCDs within two-three weeks from the date of the government's guarantee receipt. The airline is expected to tap provident, pension funds, financial institutions, employee provident fund organisation (EPFO) and other sources to sell the NCDs. The move was proposed in the airline's turnaround (TAP) and financial restructuring plans (FRP) which was approved by the cabinet. 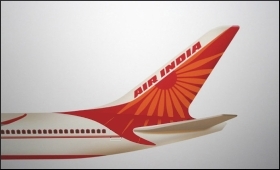 Air India had borrowed some Rs.21,412 crore towards acquisition of new aircraft, another Rs.22,368 crore towards working capital and owes around Rs.2,000 crore to oil retailers, besides facing accumulated losses worth Rs.22,000 crore. Under the financial restructuring out of Rs.18,000 crore taken by the airline from a consortium of 19 banks led by the State Bank of India (SBI), Rs.11,000 crore will be converted into long-term debt with a repayment period of 10-15 years. The remaining Rs.7,400 crore will be repaid through government-guaranteed bonds. Earlier, the government had announced an infusion of Rs.4,000 crore during the current fiscal to increase the airline's equity base to Rs.7,345 crore.